Everyone knows coal plants are bad for the environment. So why do countries still use them? Coal’s attractiveness comes from the relatively low up front capital investment required to start generating energy. 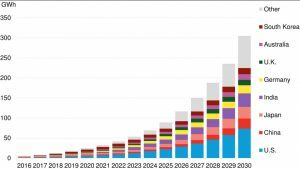 On top of that, the rapid rise of variable renewables (solar, wind) need something to rise with it to fill the generation gap when the sun doesn’t shine and the wind doesn’t blow. 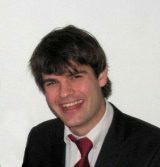 In his final instalment – after his similarly detailed analyses of onshore wind, utility-scale solar PV, nuclear and natural gas – Schalk Cloete’s comprehensive sensitivity analyses reveal how and why coal survives in the age of renewables. The rising demand for load-following plants, set against rising carbon taxes, the threat of early plant closure, and the discount rate all play a part. A cumulative cash flow analysis is presented for a coal power plant. Wind and solar expansion can improve coal profitability due to the value increase of load-following plants in a system with a high market share of variable renewables. CO2 price increases pose a major risk to coal power plants. This effect can be somewhat countered by the value increase caused by expanding wind and solar, but the negative effect of CO2 taxes on profitability remains large even in this scenario. Early closure of coal plants only has a minor effect on profitability. An earlier article offered some qualitative discussions on the risks involved in several mainstream energy options. Following the previous articles on onshore wind, utility-scale solar PV, nuclear and natural gas, this article will present a quantitative analysis of these risks for coal. The analysis will be presented for a typical developed world scenario. Developing world technology cost levels are very different and will be covered in a future article. Results will be presented in the form of a discounted cash flow analysis for only 1 kW coal power over a three year construction period followed by a 50 year operating period. 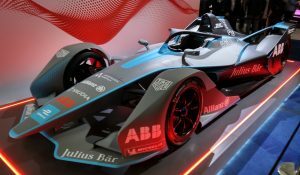 The investment is made linearly over the three year construction period, followed by the annual receipt of revenues from electricity sales and payment of fuel and operating and maintenance (O&M) costs. Capital costs are taken as $2200/kW. This was found to be a good global average when adjusting for purchasing power parity. O&M costs are taken as 2% of the capital cost per year and these costs are assumed to increase linearly by 1% per year. Fuel costs were taken as $3/GJ (about $70/ton) and plant efficiency was taken to be 45%. These assumptions were derived from cost data presented in a 2015 IEA report on electricity costs. 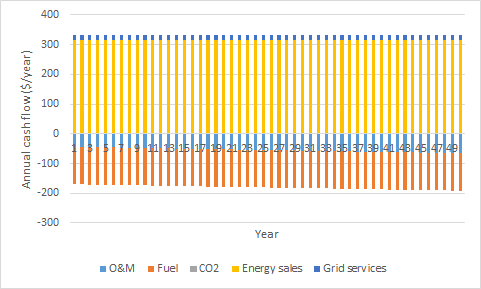 After the initial $2200 capital investment, the annual cash flows from electricity sales at an average wholesale price of $60/MWh and a capacity factor of 60% are shown below. The gradual increase in O&M costs slowly increase plant expenses over time. Load-following plants also earn some revenues from capacity and ancillary services. 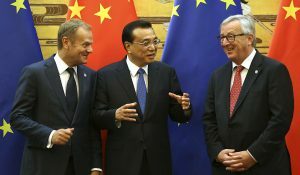 According to the latest IEA World Energy Outlook, this represents about 5% of plant revenues in the EU and 20% in the US. We will take the low value in this analysis and assume 5% of added revenues from these grid stability services on top of energy sales. Costs from load-following operation (startup costs and reduced efficiency) are small. For a 45% capacity factor, the impact of frequent plant restarts or frequent part-load operation amounts to only about $1/MWh in levelized cost in coal plants. This small added cost should be cancelled out by the conservative assumption that all O&M costs are fixed ($/kW/year) whereas, in reality, some O&M costs will decrease with lower plant utilization rates. 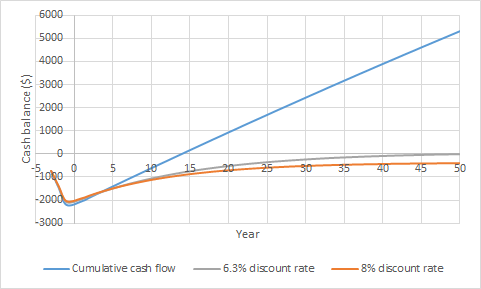 ​Using this information, a cumulative cash flow curve can be constructed (below). As shown, the initial $2200 investment is recovered in year 14 when no discounting is applied (discount rate of 0%). When a discount rate of 6.3% is applied, the net return on investment is zero. In other words, this analysis would return a levelized cost of electricity of $60/MWh if the discount rate is set to 7.7%. 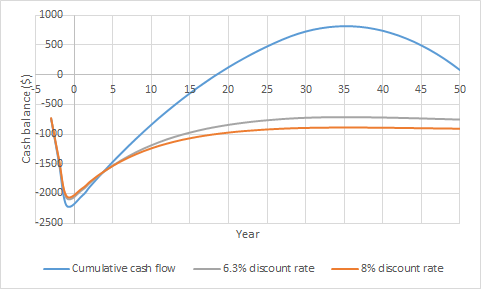 Under a more realistic discount rate of 8%, the initial investment cannot quite be recovered. 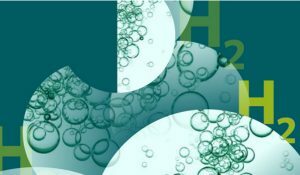 ​Next, the effects of a CO2 price and expanding variable renewable energy (VRE) market share over the plant lifetime is explored. The CO2 price is assumed to increase linearly at a specified rate over the lifetime of the plant. CO2 intensity of the plant is set to 0.8 ton/MWh, which includes upstream emissions linked to coal mining and transport. Regarding VRE expansion, it is assumed that a coal power plant falls in between gas and nuclear in terms of flexibility. As shown below, coal plant capacity factors generally fall between those of gas and nuclear because of its intermediate fuel costs. The degree of flexibility (ramp rate and start-up time) of coal also falls between that of gas and nuclear, allowing it to capture more of the value increase from increasingly volatile electricity prices than nuclear, but less than gas. 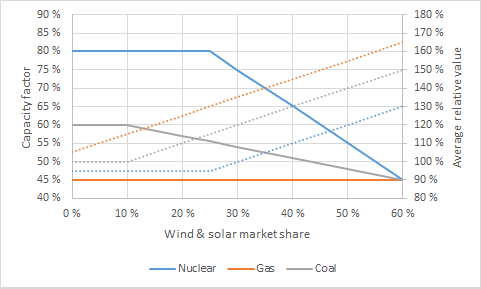 Assumptions regarding capacity factor (solid lines) and relative market value (dotted lines) for nuclear, gas and coal power plants at different levels of wind and solar market share. ​Specifically, the capacity factor of the coal plant is assumed to be 60% when VRE market share is below 10%, after which it drops by 0.3% for every 1% increase in VRE market share. Even though VRE will increasingly erode the coal plant market share, coal power will only be displaced during the times when VRE output is high and electricity prices are low, thus increasing the average value of coal power. To capture this dynamic, it is assumed that average value increases by 1% for every 1% increase in VRE market share (about half the rate at which wind market value declines). VRE market share starts at 7% (current global average) and expands to a maximum market share of 60%. The annual cash flow for a CO2 price increase of $2/ton per year and a VRE expansion rate of 2% per year is shown below. The revenues of the plant increase marginally as declining capacity factors are cancelled out by higher value with increasing VRE market share. Fuel costs also decline with the plant capacity factor. On the other hand, CO2 costs increase rapidly as CO2 prices eventually climb to $100/ton. ​The cumulative cash flow graph below clearly shows that the plant economics are negatively affected by the inclusion of CO2 pricing. The plant starts to lose money around year 35 when the increasing CO2 taxes cause expenses to outweigh revenues. The effect of discount rate on the average electricity price required is shown below where several different risks related to gas power plant investment are explored. Note that the average electricity price required is used here instead of the levelized cost of electricity to account for the value increase of coal with increasing VRE market share. This measure can be interpreted as the average market price over an entire year that will yield a zero return on investment with a specified discount rate. ​The effect of discount rate for coal is larger than for gas, but still significantly smaller than for the wind, solar and nuclear power plants discussed earlier. Relative to these clean energy technologies, coal has low capital costs (when adjusted for capacity factor), lowering its sensitivity to the discount rate. Increasing VRE market share has a mild positive effect on the economics of the coal power plant. Greater VRE penetration only displaces coal during the least profitable hours and simultaneously increases the electricity price peaks where very large profits are available to load-following plants. Being the most CO2 intensive fuel, CO2 price hikes pose a major risk to coal power plants. Interestingly, this risk becomes significantly smaller with increasing discount rate because high CO2 prices are only expected later in the plant lifetime. When the discount rate is high, these high costs in the distant future are strongly discounted, minimizing the negative effect. Coal also faces the risk of early plant closures due to sudden policy changes. When the plant is retired after 30 years instead of 50 years, the average electricity price required only increases marginally. This is simply because a coal power plant is not as capital intensive as modern clean energy technologies. Next, the three risks discussed in the previous section will be quantified in a sensitivity analysis. This quantification is done by determining the discount rate giving zero return on investment when the average electricity price is set to $60/MWh. The annualized return on investment is then quantified as the discount rate minus 2% to account for margin erosion from technological improvements of new plants that come online during the plant lifetime as well as financial/legislative costs (paying the bankers and lawyers involved in setting up financing for the plant). As shown below, the investment return is a reasonable 5.7% under the base case assumptions (blue bar). The orange bars show that VRE expansion has a mild positive effect as the value increase slightly outweighs the drop in capacity factor. 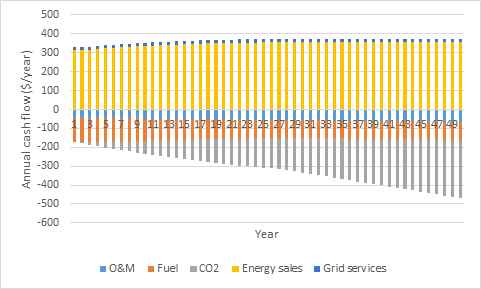 ​As shown by the grey bars, an increase in CO2 price causes very large reductions in investment returns. The plant becomes unprofitable after 35, 19 and 13 years respectively when the CO2 price increases at rates of $1/ton, $2/ton and $3/ton per year respectively. Investment returns go negative when the CO2 price increase exceeds $1/ton per year. It is unlikely that VRE expansion or CO2 price increase happens in complete isolation. 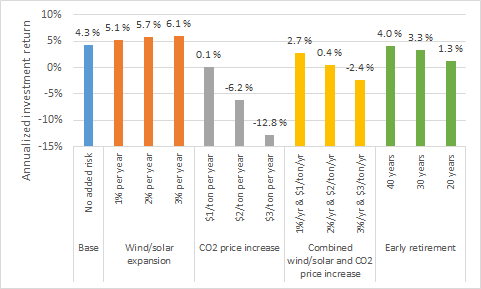 When these two effects happen at the same time (yellow bars), the value increase experienced by load-following plants with increasing VRE market share cancels out some of the negative effect of CO2 taxation. This is an important element that reduces the risk involved in load-following fossil fuel power plant investments, but the negative effect of CO2 taxation remains dominant in the case of coal power. Finally, the green bars show the relatively small effect of early plant closure. Given its relatively low capital costs, coal plants can generally recover its initial investment capital quite early in the plant lifetime, reducing the impact of a possible early plant closure. This article has quantified the impact of coal power plant risks on expected investment returns. Given the carbon intensity of coal, rising CO2 prices present the most important risk. The plant can become unprofitable already at relatively low CO2 taxes, requiring it to shut down early (or be retrofitted with CO2 capture technology). Wind and solar expansion can bring a moderate benefit to new coal-fired power plants, as long as those plants are built to maximize load-following capability. Even though increasing VRE market share will reduce the profitable operating hours over the year, the profitability of the remaining hours will increase. 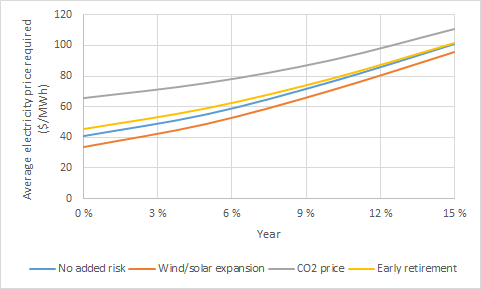 Since wind and solar expansion is highly likely in an environment with increasing CO2 prices, this dynamic reduces the CO2 taxation risk, but does not completely cancel it out as was the case for gas. Early coal plant closure due to political factors was shown to only have a minor impact on overall plant profitability because coal plants generally recover their initial capital investment relatively quickly. Even so, coal plants face serious economic challenges even when CO2 prices rise only at a modest pace. 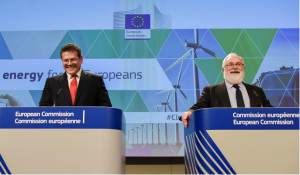 CO2 capture provides an important hedge against this eventuality and a future article will therefore investigate the impact of retrofitting coal plants with CO2 capture technology when the CO2 price eventually rises beyond a certain threshold. The analysis takes flexible demand and grid size/capacity as fixed. which they are not. 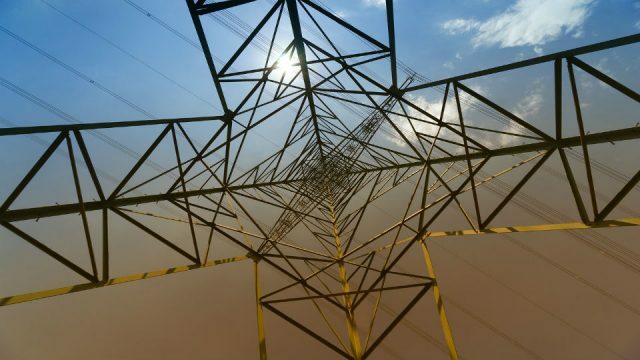 Grids earning on arbitration between markets will earn higher margins, rising faster than the margins from dispatchable generation, causing grid expansions being prefered to build or keep running relatively expensive coal plants. Exisitng Coal power usually need to run at least 2000-3000 hours per year to cover their O%M costs, otherwise new open cycle gas turbines or diesel generators are cheaper to fill the gaps (depending on the length of gaps).